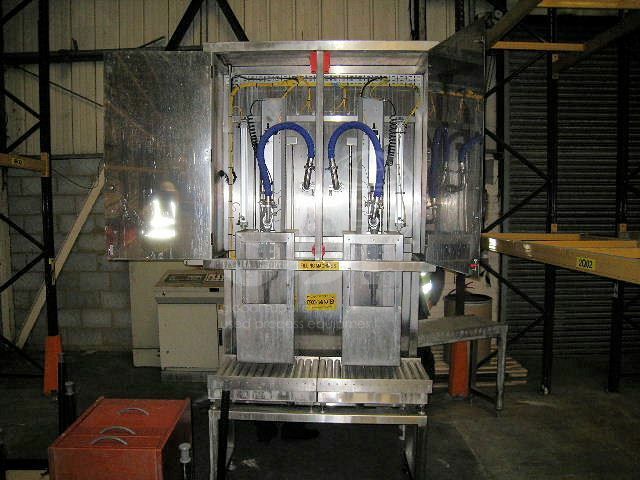 Used Twin Head Filling System, manu by RCS Filling Machine Ltd, 2003. This system is manufactured from Stainless Steel and PTFE. The filling system uses a combination of PLC and pneumatic controls, making it suitable for only a safe area application. The system fills 5kg, 10kg, 20kg, and 25kg containers via a bottom fill. It is assumed that the products being filled are foaming hence the bottom-fill operation. The amount of fill is determined by the weighing equipment used on this system. The main system is generally constructed from stainless steel, which includes the machine framework and enclosures. The ball valves and filling lances are made from higher 316 stainless steel with PTFE seats and seals. Previously used on chemicals.